Since working on our last post about haul-out costs, I've started working on a "Pre-Cruising Expense" page. It's not ready just yet, but when I came across the expense for our fairly new ports it got me thinking about them. We haven't had any leaks (thanks to Ken's great installation) and we're really happy with the updated look that the ports provide ... inside and out! Mike at CruisingConcepts had given us a discount on the ports, so I thought I'd email him to let him know that we're happy with them and send him the link to our "installation post". Before I emailed him I thought I'd visit his site to get familiar with it again, and see what he's selling nowadays. 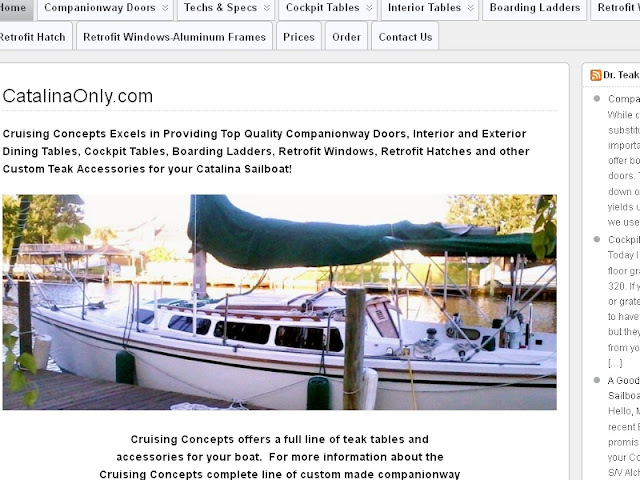 I pulled up his site, clicked on the "CatalinaOnly" tab, and saw a picture of a really nice Catalina ... our Catalina! It's a weird feeling when your boat pops up unexpectedly ... and a real complement too. We've always thought Nirvana was a good-looking boat, but it's nice to see her as the "cover girl" on another site. Mike has some great items that we'd love to add to Nirvana someday, especially those companionway doors. Hasta luego ... until then. Mid-Life Cruising! That's cool and then some. You're famous. Well Nirvana is. I love this. Now, wouldn't that be exciting! Very nice. It great to see hard work appreciated.